To open a car dealership in Colorado you will need to apply for a license at the Colorado Department of Revenue’s Auto Industry Division. For your license, you will need to pass pre-licensing certification and an exam, as well as submit numerous documents, along with your Colorado auto dealer bond. Want to know more? 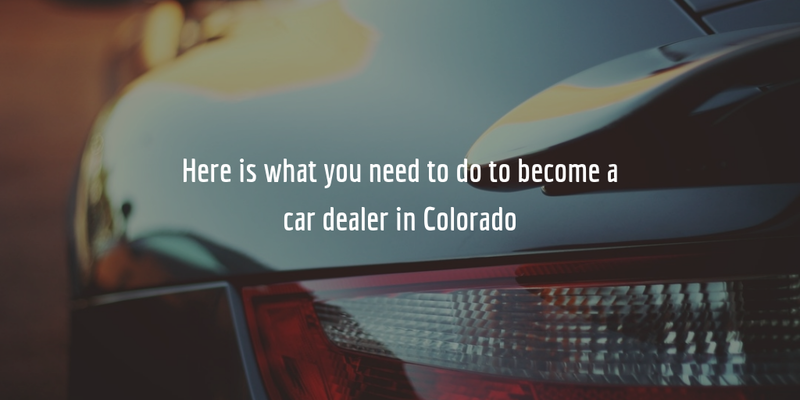 Read our detailed guide on getting your Colorado dealer license below! If you pass these criteria, you can go ahead with fulfilling the requirements for your license. To apply for your dealer license you must complete the Colorado dealer license application (DR 2109). Then you must also include the various documents and items listed below. Once you have taken care of all of the above requirements, you are ready to submit your application to the Division. Your application will then be reviewed and you will be notified by the Division whether your application has been accepted or denied. If you have any questions regarding the licensing process, you should contact the Division to receive further information. So what about your car dealer bond? The auto dealer bond is an important dealer licensing requirement. Those bonds are put in place to provide protection to the state government and the public when dealer licenses are issued. They provide financial protection against dealers who violate state statutes and the conditions of the bond by, for example, acting dishonestly and misleading customers. Applicants for a dealer license must pay a certain premium to obtain the $50,000 Colorado auto dealer bond. The cost of their bond is a fraction of the whole amount. This fraction is determined by the surety bond company that issued the bond for the dealer. In determining the cost, the bond company takes into account the personal credit score of the applicant, as the most important factor, as well as the applicant’s financial statements and other financial indicators. Typically, applicants with a high credit score can expect to get a rate that ranges between 1%-3% of the total bond amount. I.e. to obtain a $50,000 bond, you will need to pay between $500 and $1,500. To apply for your Colorado auto dealer bond, complete our online surety bond application. We will then contact you with your personal and entirely free bond quote. If you have any questions regarding the bond process, call our experts at 866.450.3412 anytime!